THPBlog: Sierra Pacific Industries to clearcut log east of Trinity Lake. 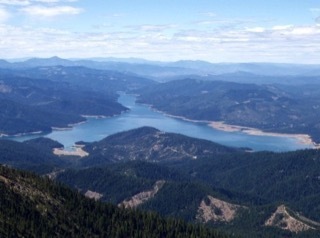 Sierra Pacific Industries to clearcut log east of Trinity Lake. This THP is about 16 miles NE of Weaverville, CA and about 4 miles east of Trinity Lake at an elevation of 2,700 to 4,680 feet. Sierra Pacific Industries is planning a clearcut tractor and cable logging operation on steep and unstable slopes in ponderosa pine, Douglas fir, incense cedar and sugar pine forests. There is 1 unstable area in section 21 inside unit 21B. SPI wants to use tractors adjacent to an unstable area in unit 21B, and use tractors on steep slopes exceeding 50% grade with a high erosion hazard rating in unit 13B. They also are planning to construct segments of steep roads on slopes over 65% grade inside units 35A, 35B and 35C. Five road drainage sites are planned for work including rocking, dip construction, ditch cleaning and culvert repair/replacement. In 1997, a Pacific fisher was spotted 1,061 feet from unit 35F in Section 2. Eight sensitive plant species were found including: Klamath mountain catchfly within units 5A and 5C, Slender false lupine in unit 5I, Siskiyou onion near unit 7D, English peak greenbriar within units 5C and 35A, Canyon creek stonecrop in unit 13A, Redwood lily on roadsides near unit 35A, Northern clarkia inside units 7D, 13B, 19A, 21C and 35D, and Blushing wild buckwheat near units 7C and 19B. There are 8 spotted owl nesting territories within 1.3 miles of the THP area (.5 mi to 1.275 mi).